ChromaChecker provides users with the ability to configure one color bar which will assess both process color compliance such as G7 and up to four variable spot colors at the same time. This functionality also works if only specifying spot colors. If the given job doesn't have some or all spot colors, the operator can specify that the spot color positions are paper white patches allowing the operator to "on the fly" accommodate any combination of spot and process colors at the point of assessing the print conformance. 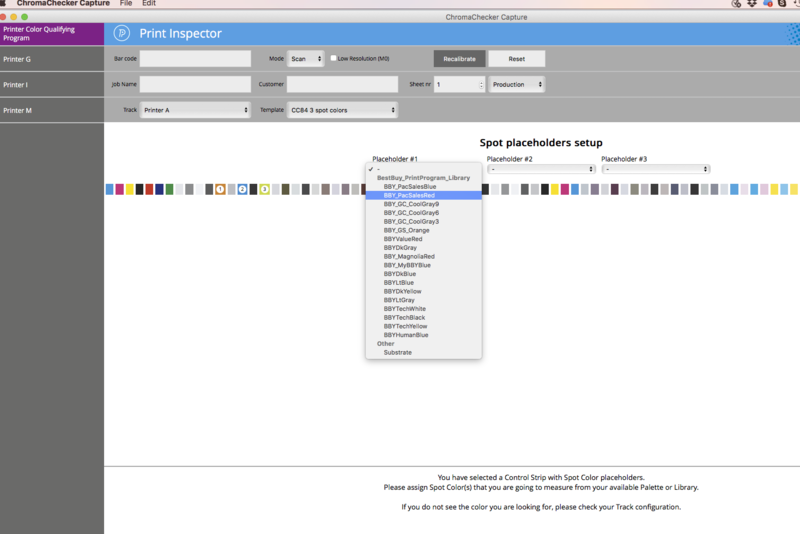 The screen shot above shows how multiple brand/spot colors can be selected by the operator as any assessable spot color or paper white patch allowing a company to use one color bar to assess virtually any process and brand/spot color combinations on the fly saving a lot of planning and inventory of spot specific color bars making assessing brand/spot colors easier than ever before.